No seasoning required Safe on all cook tops and in the oven to 475 degrees F. Hand washing is recommended to preserve the cookware's original appearance . 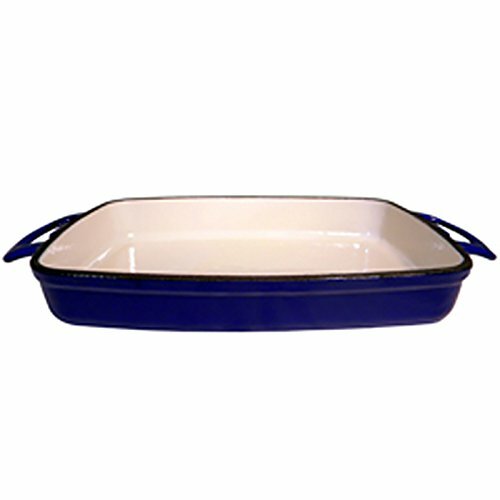 Our all enamel cast iron roasting dish are preseasoned interior, allowing a lowest price with the same quality of all other comparable enamel cast iron roasting dish. The flat bottoms are enameled as the blue exterior. Dimensions: L11" x W8 1/2"x H1 3/4". Exterior: Enamel Coated Blue . Dimensions: L11" x W8 1/2"x H1 3/4". If you have any questions about this product by FancyCook, contact us by completing and submitting the form below. If you are looking for a specif part number, please include it with your message.